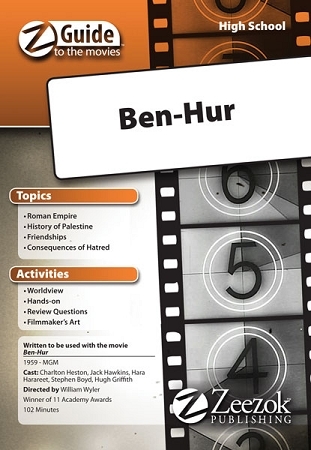 Zeezok Publishing's Z-Guide to Ben-Hur is a great way to incorporate media into your study of Medieval Europe. This guide contains a topic overview movie synopsis and ten learning activities for an in-depth study of the film. Learn more about Roman chariot racing and Jewish attempts to overthrow Roman rule. Think through your stewardship responsibilities or identify elements of Roman government found in the film. Evaluate your own beliefs with the Worldview Activity probe the directors mind with The Filmmakers Art activity and get the entire family involved with the For Family Discussion section at the end of the guide. Choose those activities which best fit your students course objectives areas of interest or time schedule. Movie Summary: The Romans begin to assert more and more control over the Jews in the first century BCE. By AD 6 Rome has taken complete political control of Judea. Several unsuccessful attempts to expel the Romans including the misguided belief that Jesus Christ had come to be their political Messiah result in harsh Roman reprisals and the Diaspora (scattering) of the Jews. This Z-Guide is based on the movie Ben Hur (1959). You can view a trailer for the movie below.